I lost my reading mojo for a while and got behind for my reading goal. Then I got sick. Most of my family got this nasty cold that has been going around. My husband was a lot worse that I am and he's already getting better. I have a head cold and my throat is so sore. I don't really have my reading mojo back completely but I had a little itch to read here and then. I took this book with me on our trip to Denali for our Anniversary on the 1st but didn't really have time to read. It was our 27th Anniversary and we had fun even though it was rainy. There's some pictures from our trip on my instagram. I finally finished this book and I was having a hard time with the review. I'm not sure if I'm really being fair or if I just don't feel well. This book was better than many of the others in the series as far as the writing goes but the story felt like a cat and mouse game with a lot of back and forth without any progress. Anyway, here is the review I wrote. Mary Beth, the owner of the local needlework store in Stony Point, received word that the owner of her building and the theater next door needed to sell both properties. His wife was ill and he needed the money to pay for her surgery. He told Mary Beth she would buy the property but she needed to buy both. He gave her until the end of the month to come up with the money. He also made a deal with a large burger chain that wanted to buy the property which was located on main street. They wanted to tear down the building where the Mary Beth's shop was for a parking lot and make the theater their newest Burly Boy Burger but they had to wait until the end of the month to honor the agreement with Mary Beth. The problem was that Mary Beth didn't have the money and had no idea where it would come from. Her friends all wanted to help and all started looking for things they could sell to help. Annie found a pretty vase in her attic she intended to sell but she dropped it and it broke. When she was cleaning up the mess she found an old key with a lion on it. She remembered that it was something Mary Beth have given her a long time ago and that she also had other antique furniture with the same lions that her mother had passed down to her. That old furniture had belonged to Mary Beth's grandmother and had been in their family for 150 years. She took it to Mary Beth and they looked at the antique furniture for a hidden spot for a key hole. They finally found one and inside a hidden cubby hole they found a message with a riddle. They started to try to solve the riddle and soon realized their was another clue in the antique writing desk, only Mary Beth had just sold it. They decided to try to track it down to ask if they could look for a hidden spot and see if their was another clue. This story was so interesting but it kept losing me too. 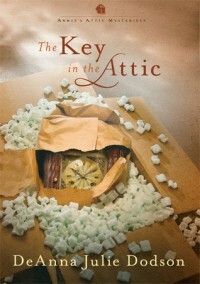 I liked the mystery of the antiques and the keys and messages and how it connected with family history but for some reason I didn't read right through it like many of the other books. I kept putting it down and forgetting about it. I think there was just too much going on that made it feel disjointed. When it got to the part where Annie got the idea about the trees I thought I'd missed a page or something. It finally made since later in the book but it still seems like odd leap. Still, I did like the writing style of this author more than some of the others. Her writing is more current and the characters felt more realistic. I think the story just needed a little smoothing out.